Brazilian anthropologist Manuela Carneiro da Cunha examines here the complex meaning—and anthropological implications—of the word “culture” for indigenous peoples. Caneiro da Cunha explores the contradictions inherent in the interface between Western and traditional understandings of knowledge and intellectual property rights. 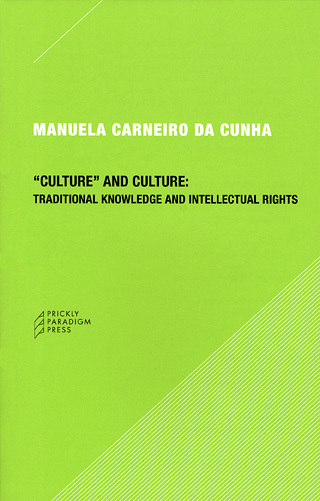 Distinguishing culture from “culture,” the latter being a reflexive awareness of one’s culture, Carneiro da Cunha then poses questions such as: What are the cognitive and pragmatic consequences when “culture” and culture coexist? She shows how the word “culture,” as used in the anthropological sense, is employed by indigenous people to distinguish the different interpretations and avoid contradictions. “Culture” and Culture offers a concise and innovative anthropological study of a crucial issue faced by indigenous peoples the world over. How Do Negotiations About Traditional Knowledge Arise in the First Place?